This DWF2SVG converter allows you to publish your CAD drawings as SVG (Scalable Vector Graphics), an open-standard W3C standard for the presentation of compact and high-quality graphics on the web. Convert DWF drawings to Adobe SVG files. Choose paper space, model space, active layout, all layouts for conversion. Customize line weight and scaling. Specify output dimension such as height and width. 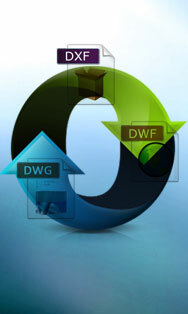 Support DWG, DXF, DWF files forward and backward with versions as early as AutoCAD Release 9 and as recent as AutoCAD 2017. No need for Autodesk AutoCAD. Free upgrades in the future.